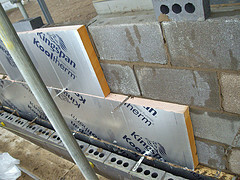 Insulation, and the impact it has on the star-rating, seems to be the hot topic at the moment. Following on from the previous issue on floor insulation, in this e-newsletter we will be discussing insulation further with a focus on ceiling insulation. The above is a typical duplex. Unit 1 is double-storey and unit 2 is single-storey. Both units have plenty of north facing windows. Unit 1: Ceiling Insulation R3.5; Wall Insulation R2.0; Energy Rating Efficiency 6.0 stars. Ceiling insulation used between floors. Complies with current BCA 2009 and upcoming BCA 2010. Unit 1: Ceiling Insulation R3.5; Wall Insulation R2.0; Energy Rating Efficiency 4.3 stars. Ceiling insulation only used for upper floor only. Does not comply with current BCA 2009. Few windows will need to be changed to be double-glazed to increase the rating. Unit 2: Ceiling Insulation R2.5; Wall Insulation R2.0; Energy Rating Efficiency 6.8 stars. Complies with current BCA 2009 and BCA 2010, from May 2011. Garage internal walls and garage ceiling have been insulated and roof has sarking. Unit 2: Ceiling Insulation R2.5; Wall Insulation R2.0; Energy Rating Efficiency 6.3 stars. Complies with current BCA 2009 and BCA 2010, from May 2011. Without garage internal walls, ceiling insulation and sarking. From the above, it is evident that ceiling insulation between floors will significantly increase the energy rating in an economical way. 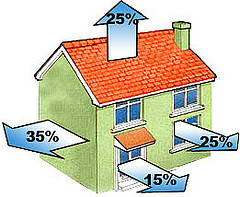 Additionally, roof sarking, garage walls and ceiling insulation can increase the energy rating by about 0.5 stars. This application is useful now for 5 stars regulation and will add value when 6 stars regulations applies from May 2011. We have recently completed several multi-level apartment projects. When ceiling insulation is proposed between floors, the energy rating efficiency will generally improve by 10% - 20%. This is significant! A particular 16 apartment project in the inner suburbs of Melbourne, had an average rating of 6.7 stars without using any treated or double-glazed windows! This complies with the current Code of a combined average of 5 stars and the upcoming BCA 2010 (to be applied from May 2011), a combined average of 6 stars.